Category: ROMANCE PINK. Tags: Biustonosz, Biustonosz balkonetka. Romantic and sensual soft bra type balconette perfectly lifts and collects the breasts. 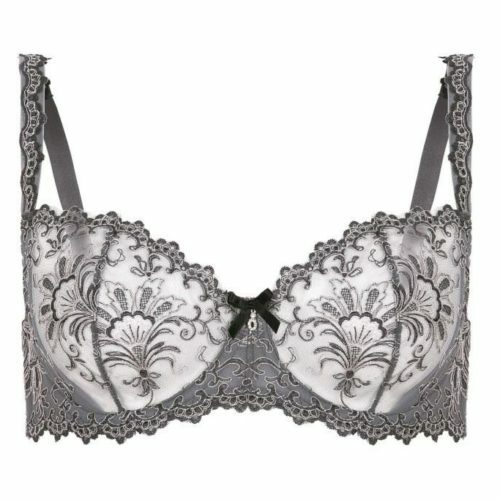 The bra is made of delicate fabrics and Italian embroidery Ricamificio Di Fagnano. The cups are reinforced thanks tulle placed on the sides of bra. For better effect, the construction is strengthened with underwires. In the middle there is a delicate bow that adds charm. Fixed, decorated with gentle embroidery, adjustable straps and multi-step fasteners ensure perfect fit. For the set of underwear we recommend the string, garter belt, briefs or hipster briefs from the Romance Collection. Available in colour: white, black, red, indigo, ecru, pink, coral and graphite.